هتل ساحلی لردوس Lordos Beach درست در ساحل شنی خلیج لارناکا Larnaca واقع و یکی از نخستین هتل های ۴ ستاره در قبرس به شمار میرود. این هتل ۴ ستاره که در باغهای اختصاصی خود قرار گرفته ، با داشتن محیطی شیک و راحت و خدمات حرفه ای کارکنان مسئول به خود میبالد. هر یک از اتاقها به ملایمت رنگ امیزی و از امکانات مدرن مورد نیاز میهمانان برخوردار میباشند.هتل چهار ستاره لوردوز بیچ (Lordos Beach) در ساحل شنی لارناکا و در فاصله نزدیکی از هردو، فرودگاه بین المللی لارناکا و مرکز شهر، واقع شده است. اقامت در این هتل تجربه اقامت در هتلی زیبا و راحت با امکانات بسیار عالی و مدرن را برای شما فراهم می آورد. هتل دارای جایگاه دوم در بین هتلهای این منطقه و رتبه 8 از 10 براساس سایتهای معرفی هتل و تجربه مهمانان پیشین می باشد. هتل در ۵ طبقه با تعداد ۱۷۵ اتاق شامل اتاقهای با منظره دریا از روبرو و یکسو ۲۳ مترمربع،سوئیت کوچک۲۷مترمربع، سوئیت بزرگ یا اتاق خانوادگی۴۶مترمربع، رویال سوئیت۶۰ مترمربع میباشد. اتاقهای با درب میانی Connected که مرتبط بوده و برای خانواده ها مناسب می باشد. علاوه بر اتاقهای راحت و مناسب، پرسنل حرفه ای هتل و غذاهای متنوع و لذیذ آن، از برتریهای این هتل در نظر مهمانانش می باشد. هتل دارای استخر بسیار زیبا همراه با ساحل اختصاصی می باشد که به جذابیتهای آن افزوده است. 3 استخر خارجی وجود دارند که یکی از آنها جهت استفاده کودکان عزیز شما تعبیه شده است و همچنین امکانات جکوزی فضای باز نیز برای استفاده شما وجود دارد. خارج از هتل و در فاصله نزدیک، امکان استفاده از وسایط نقلیه عمومی وجود دارد. همچنین تعداد زیادی رستوران در اطراف هتل وجود دارند که بنا به تجربه مهمانان قبلی، غذاها و سرویسهای رضایت بخش و با کیفیت ارائه می دهند. در تمام قسمتهای هتل امکانات اینترنت وای فای به طور رایگان و با سرعت بالا وجود دارد. هتل لوردوز نه تنها مکان مناسب و دلپذیری برای گذراندن تعطیلات شما می باشد بلکه برای گذراندن مراسم ازدواج، ماه عسل و تولد نیز بسیار ایده آل می باشد. پرسنل کارآمد و باتجربه هتل هرگونه خدمات و سرویس مورد نیاز را به بهترین نحو برایتان فراهم می آورند تا لحظات شاد و لذت بخشی را برایتان رقم بزنند. در مدت اقامت در هتل، علاوه بر غذاهای متنوع، استخر شنا و ساحل زیبا، از امکانات سالن ورزشی هتل و سالن تنیس آن نیز استفاده کنید. میهمانان میتوانند از فضای دوستانه و خوراکهای خوشمزه تریای لابی دنج و راحت هتل و یا رستوران Atlantis لذت ببرند .هتل اقامت ممتاز را با خدمات عالی و تفریحات متنوع به هم آمیخته و با امکانات سرگرم کننده و ورزشهای آبی متنوع و فراوان دیگری تکمیل نموده است. موقعیت مرکزی هتل موجب شده تا میهمانان به راحتی به مرکز شهر و فرودگاه بین المللی لارناکا Larnaca دست یابند. صبحانه بوفه متنوع، سرویس ۲۴ ساعته، فضای سبز، پارکینگ، دکتر۲۴ ساعته، آرایشگاه (آقایان و بانوان)، خشکشوئی، آسانسور، ۲ رستوران سرپوشیده، ۲رستوران روباز، منوی رژیمی، ۲ اتاق کنفرانس با ظرفیت ۲۲۰ نفر و امکانات)(ویدئو، پروژکتور، تلویزیون، اینترنت ...)، بار، کافی شاپ، ۱ استخر سرپوشیده، ۱ استخرروباز،۱ زمین تنیس (رایگان در روز)، کارمندان مسلط به زبانهای انگلیسی، یونانی، فرانه، آلمانی، ایتالیائی و روسی، اجاره ماشین در هتل، تاکسی در هتل، فروشگاه در هتل، فکس و اینترنت. بدنسازی(رایگان)، استخر(رایگان)، والیبال ساحلی(رایگان)، تنیس روی میز، تنیس(رایگان)، انواع بازیهای آبی، سونا(با پرداخت)، جکوزی(با پرداخت)، ماساژ(با پرداخت)، سولاریوم(با پرداخت)، غواصی، قایق سواری، جت اسکی، برنامه موسیقی زنده(رایگان)، اجرای برنامه های شاد و سرگرم کننده. تراس، تهویه مطبوع، تلفن مستقیم، مینی بار، ماهواره، تلویزیون، کانالهای تلویزیونی اضافی(با پرداخت) تلفن، وان حمام، صندوق امانات(با پرداخت)، سشوار، امکانات تهیه چای و قهوه بر اساس تقاضا، تخت بچه(براساس تقاضا)، تخت اضافه برای بزرگسال(بر اساس تقاضا)، تعویض حوله و ملحفه هر روز، نظافت روزانه، کف اتاقها موکت است. هتل ساحلی لردوس را به صورت آنلاین رزرو کنید! The hotel offers accommodation in its 175 non-smoking and bright rooms. Each of them is furnished with air conditioning, climate control, iron and ironing board on request, 24 hours room service, in-room massage available, surcharge in-room childcare, cribs/infant beds available, private bathroom, hairdryer, free toiletries, mini-bar, working desk, phone, in-room safe, cable TV service, paid Wi-Fi, balcony, and daily housekeeping. Check-in time starts at 2 PM and check-out time is noon. * The 173 rooms of the hotel were all beautifully fully redesigned and refurbished in two stages in?2002 & 2006. The general ambiance of the accommodation is set by the green ash wood doors, and the almond green carpet in the spacious hallways. * All the rooms are very comfortable and beautifully appointed. The color schemes are very fresh and relaxing. The thick light green room carpet blends very nicely with the natural green, yellow and blue pastel colors of the upholstery and the fabrics. All the rooms enjoy a side sea view to the Mediterranean and feature a side balcony. The color coordinated padded walls give an extra touch of luxury and comfort. All of the rooms are upholstered in tasteful natural pastel fabrics and feature spacious cupboards. Beautiful pictures from scenes around Cyprus decorate the walls. The lighting of the rooms was also very carefully designed and installed so as to provide a very natural living environment through out the day and night. * Special comforting features such as a full length mirror, hairdryer, mini bar, T.V. & pay T.V., comfortable furniture such as a round table with chairs and a dressing table. The privileged front sea view rooms have two balconies, one at the side of the hotel and the other directly on the front, on top of the pool, overlooking the Mediterranean. The front balcony features hanging iron, terra cotta pots and comfortable green director\'s chairs where one can enjoy the beautiful views of the garden, the pools, Larnaca Bay and the blue waters of the Mediterranean. 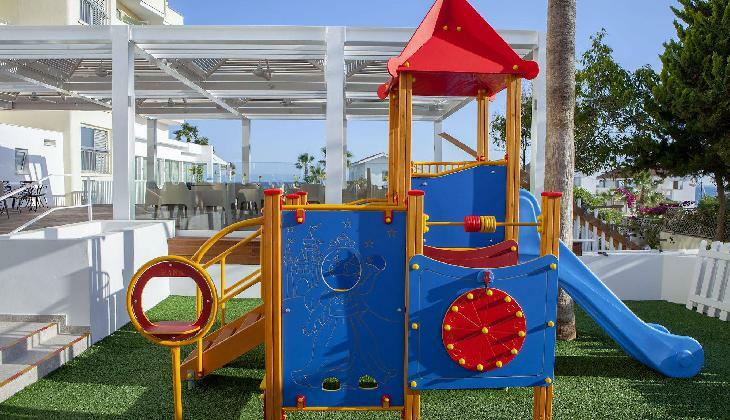 During your time at Lordos Beach Hotel you can benefit from a wide range of facilities. There is 24 hour front desk, tours and tickets assistance, beauty shop, safety deposit box, facilities for disabled guests, currency exchange, car hire, bicycle rental, meeting and banquet facilities, designated smoking area, water sport facilities, indoor & outdoor pool, tennis court, fitness center, children’s playground, fitness center, table tennis, sauna, games room, massages, library, snack bar, restaurants, bar & lounge, mini-market on site, multilingual staff, free Wi-Fi, and free private parking. * Choose the elegance of dining in The Oceanis Restaurant with its glorious Sea vistas or the cool sea breeze at the pleasantly renovated Atlantis coffee shop and restaurant. * Theme nights at The Lordos Beach are occasions to enjoy a superb evening of food and entertainment. Cyprus night presents a huge buffet of authentic Cypriot \'Meze\' Dishes to the accompaniment of traditional dancing and music. * The Lordos Beach Hotel also understands the value of good entertainment. Happy Hour every night, weekly wine tasting gatherings and live music are standard events on our animation programmes that reaches a peak during the summer season. Allow us to highlight your holidays with: Folklore shows, Variety Shows, and various Theme Nights focusing on regional cuisine and entertainment. Also, special inland excursions are available on the weekly program. * The outdoor pool area with cascades, jacuzzi, waterfall and safe paddling pool is always a favourity and immediate attraction. For exercise, challenge or excitement, the floodlit tennis court, beach volleyball and all the \'IN\' sea sports are just waiting for you: windsurfing, water skiing, parasailing, speed boats, canoes, pedaloes. Children will automatically drift to the colourful playground. Aqua mini park with ride into new swimming pool. Enclosed playground area in the castle. * The heated indoor pool ensures that you don\'t miss your swim any time of the year. For workouts, check out the well equipped gym or join in aerobics and aquagym classes. Treat your body to a sauna or steambath and pamper it with a professional massage. A visit to beauty salon will soon have you looking good and feeling great. * The well designed conference rooms in conjuction with support and professionalism of our staff, guarantee the satisfaction of our guests. The Lordos Beach Hotel provide three function rooms that can be equipped, furnished and decorated to suit your specific business or social function. The Food and Beverage Dept. will suggest various coffee breaks, luncheon and dinner menus, cocktail reception, etc. to suit the occasion and match your budget. 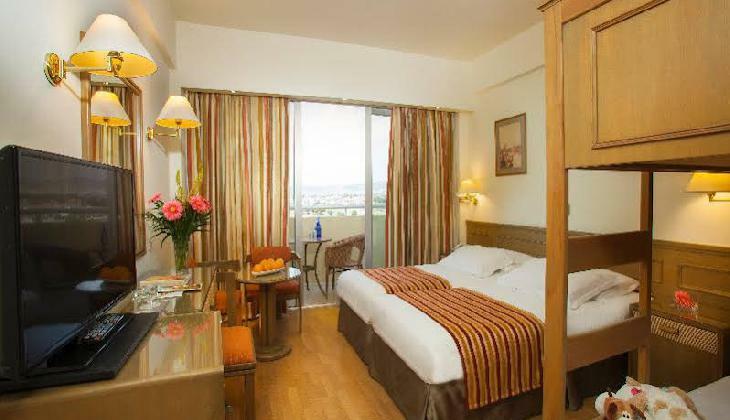 Lordos Beach Hotel is a stylish hotel located in Larnaca, Cyprus. The hotel is close to Panagia Angelokistos, CTO Beach, and Larnaca Castle. The 4 stars hotel is a nice choice for friends, couples, and families who want to relax and have fun in the city. It makes for a great starting point of an unforgettable holiday experience. Lordos Beach Hotel is an awarded hotel which awaits its guests with an outdoor pool, water sport facilities, and free Wi-Fi, so you can have the most enjoyable time here. The hotel is situated on a private beach boosting amazing views over the Mediterranean Sea, and being just 15 minutes away from the city center. The closest airport to the hotel is Larnaca International Airport situated 12.3 km / 7.6 miles away. To travel around the city you can rent a car/bike, or you can walk by foot. Larnaca is a chosen destination for its white sand beaches, nightlife, and for practicing water sports. Still, there are several points of interest worth visiting. Nearby Lordos Beach Hotel there are Larnaca Marina, Finikoudes Beach, Port of Larnaca, Europe Square, Church of Saint Lazarus, Larnaca Aqueduct, Larnaca Castle, Larnaca Salt Lake, GSZ Stadium, and Hala Sultan Tekke.